Blackberry once upon a time were a behemoth. They were huge in business, popular with consumers and everyone loved BBM. If we fast forward to the present then it's not quite as rosy over at their HQ in Canada. It seems that the boys almost missed the boat when things changed to touch screen, leaving them with tonnes of qwerty devices which seemed a little outdated. If we fast forward to now, things are looking a little better. The company has released the Z10, which is not a bad smartphone at all, but it does have a lot of last years specifications at the price of this year's smartphones, which isn't a smart move. There's also the Playbook and the Q10 on sale now! 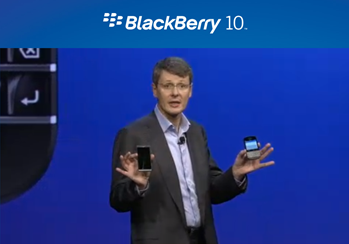 With regard to the qwerty Blackberry Q10 Heins said that, "We have very, very good first signs already after the launch in the UK.” He then said that sales of the Q10 were building on an “installed base of more than 70 million BlackBerry users... We expect several tens of million of units.” That last statement is a little strange because that quantity of sales seems a little excessive given that the population of the UK is just below 70 million, but we suppose there are a lot of business users! If you're interested in the full interview then check it out on Bloomberg here. Take it with a pinch of salt though, it's quite likely that he's been misquoted! So there's still the potential that we will see a tablet in the future, just Heins doesn't think one will arrive?